Since the 1970s, this city of 225, 000 has taken drastic measures to undo a legacy of car-oriented city building in favour of a more integrated approach to transportation and land-use planning. 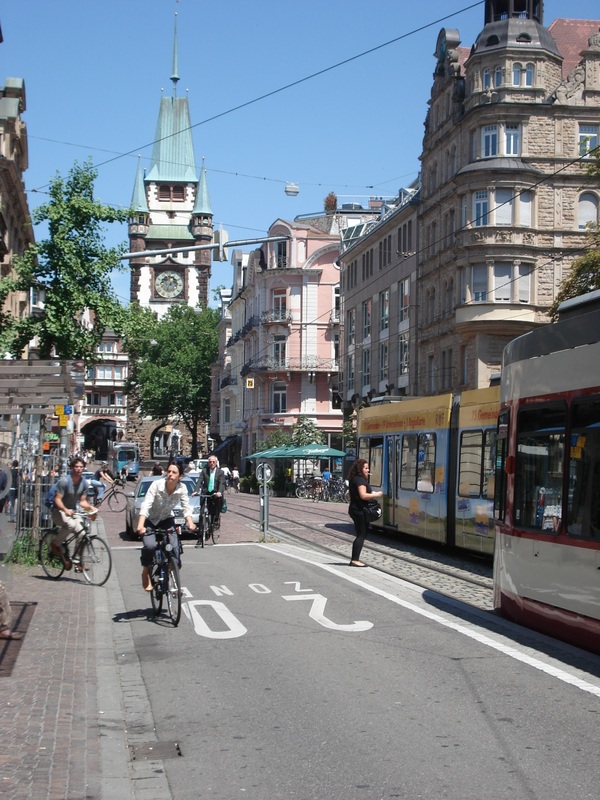 Freiburg’s trend towards a more sustainable transportation system is impressive; in short, between 1980 and 2010 Freiburg’s car share of trips fell from 38 to 32%, while the shares of trips by bicycle and transit increased from 15 to 27% and 11 to 18%, respectively. This shift away from the private automobile is the culmination of a 50 year long process that has increasingly prioritized walking, cycling, and transit. From today’s perspective, the foundation for more sustainable transportation was laid right after World War II, when the city administration decided to rebuild Freiburg’s Old Town –destroyed during a bombing raid in WWII – using its old medial footprint with small lots, a mix of land-uses, and narrow streets. However, in the period immediately after WWII, Freiburg’s transportation and land-use policies were neither integrated nor sustainable, ultimately promoting urban sprawl. Between 1950 and 1970 the city prescribed wide streets, connected Freiburg’s city center to the Autobahn system, transformed historic squares into car parking lots, and tore out light rail tracks to free-up street space for cars. 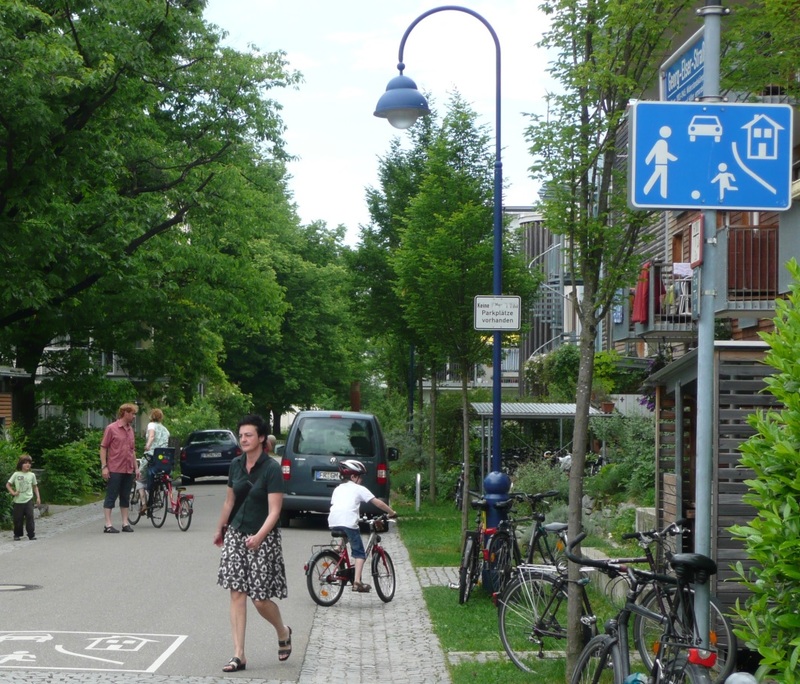 Faced with environmental pollution, deteriorating traffic safety, loss of quality of life, and the oil crises of the 1970s, Freiburg’s city council implemented a series of uncoordinated transportation and land-use policies geared at environmental protection. Policies included the preservation and eventual expansion of the light rail system, creation of a bicycling network plan, and making the center of Old Town more pedestrian friendly. The success of these plans is best highlighted by the redevelopment of two inner suburban brownfields around newly extended light rail lines: Vauban, a former military barracks, and Rieselfeld, a former sewage farm. Both districts were developed in the 1990s with significant public input – often citizens pushing the city administration towards more stringent policies that promote sustainability. As a result, Vauban and Rieselfeld sharply limit car access and parking. All streets are traffic calmed at 30 km/hr (19mph) and many neighborhood roads are designated as home zones, streets with speed limits set at 7 km/hr (4mph) and traffic priority for pedestrians, cyclists, and playing children. Ralph Buehler, PhD, is an Associate Professor in Urban Affairs & Planning with the Metropolitan Institute at Virginia Tech’s Alexandria Center. His research compares transport and land-use policies, transit systems and travel behaviour in Western Europe and North America.